Montana’s 2019 Legislature is now in session. This year, the Montana Chapter of The Wildlife Society has teamed up with Amy Seaman and Wyatt Smith from Montana Audubon as they track bills that affect Montana’s wildlife, as well as habitat, and other environmental laws. Amy and Wyatt will be providing regular updates to MTTWS as the session progresses. Here are a few links to help you find out more about what is happening in the legislature this year. 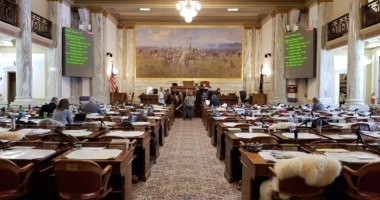 For additional information regarding our work with the state legislature, contact Amy Seaman: aseaman@mtaudubon.org, 406.210.9449, or Wyatt Smith: 406-241-7897. Citizen Lobby Day - March 8! Montana Audubon is hosting a citizen lobby day on March 8 at the Capitol. To see what it is all about, you are invited to attend. Please RSVP by emailing Amy or Wyatt (aseaman@mtaudubon.org) or (wsmith@mtaudubon.org). It is now less than two weeks until the transmittal break: there is plenty to be done and we will need your help! Please contact your legislators and tell them why they should (or shouldn’t) vote for the bills on this action alert. It is imperative that they hear directly from their constituents. Montana Audubon will send an additional action alert this week to keep you up to date with the continual evolution of important bills related to Montana’s habitat and wildlife. Also: don’t forget, our citizen lobby day is coming up on March 8th and we would love to see you. Please RSVP by emailing Amy or Wyatt (aseaman@mtaudubon.org) or (wsmith@mtaudubon.org). Let’s all continue to do our part for Montana’s birds and other wildlife! HB 22 returns contract lengths for independent wind and solar “Qualifying Facilities” (QF’s) to 25 years, the same length they were before a harmful 2017 Public Service Commission ruling. QF’s are the largest driver of new wind and solar projects in Montana. Twenty-five years is a standard contract length for power plants. NorthWestern Energy itself has asked for and received guaranteed revenue recovery for its own power plants at lengths of 25, 30, 34, and 50 years. SB 186, introduced by Senator Mike Phillips (D-Bozeman), would add predators to MCA 87-6-214. This code does not allow contests or prizes to be given by a person, firm, or club for taking capturing, killing, or in any manner acquiring any game, fowl, or fur-bearing animal, any predatory animal as defined in 81-7-101, or any bird or animal protected by law. SB 186 is adding the underlined line (above) to the code. The intent of the original statute was to protect all wildlife from commercialization; therefore predators should also be included. SJ 8 is a joint resolution to the U.S. Congress that asks the federal government to change its current policy on climate change and join the international community in making a joint, concerted effort to implement global policy that would scale-back greenhouse gas emissions–among other important, forward-thinking policies–heading into the future. HB 497 and HJ 18 by Rep. Wylie Galt — Both would allow additional elk to be harvested during shoulder season. They are both being heard today in House Fish, Wildlife, and Parks at 3pm. SB 186 & SB 187 by Sen. Mike Phillips are both predator bills. SB 186 would prohibit contests or prizes for predators and SB 187 would prohibit vehicular injury of predators. They are being heard today in Senate Fish & Game at 3pm. HB 279 – Rep. Bob Brown – Reimburse trappers for costs incurred – Still waiting for executive action in House, Fish, Wildlife & Parks committee. Amendments are proposed and EA should occur this week. We have the Governors Bill on Aquatic Invasive Species (HB 411 — carried by Rep. Willis Curdy) Bill hearing on Friday in House Natural Resources at 3pm. That is all all for now! As always, feel free to join us at the Capital any day! And I am happy to answer any questions! The word of the month is transmittal. As we approach that deadline in two weeks, the tension growing at the capital is a palpable. Bills are being introduced continuously, but we are continuing to fight potential legislation that would be devastating to wildlife, habitat, and environment generally in our state. However, there is only so much we can do alone: please join us for our second citizen lobby day on March 8th. If you are planning to join, please RSVP by contacting Amy Seaman (aseaman@mtaudubon.org) or Wyatt Smith (wsmith@mtaudobon.org). Thanks for your support, and remember, we are better when we flock together! HB 265 introduced by Representative Kerry White (R-Bozeman) would insert politics into the decision making process of Montana Fish, Wildlife and Park’s (FWP) purchase of conservation easements. This bill would add an unnecessary layer of government to conservation easements for fish and wildlife habitat protection and public hunting access. It would require state Land Board approval for conservation easements under the Montana Fish, Wildlife and Parks Habitat Montana program if such easements are larger than 100 acres or valued over $100,000. This directly conflicts with a 2018 state Supreme Court ruling that found easements were not intended to require Land Board involvement, and are final, once approved by the state Fish and Wildlife Commission. Please call the House Fish, Wildlife & Parks committee and ask them to vote NO on HB 265. House Bill 279 was introduced into the House Fish, Wildlife & Parks Committee on January 31st. This bill would allow licensed trappers to trap wolves and then be reimbursed with private funds for costs incurred during harvest. This bill amounts to a bounty on wolves, commercializes wildlife, and won’t solve elk or wolf management challenges. Wolves are an ecologically important native species with a liberal, well-regulated harvest season. Reimbursing trappers for costs incurred is a slippery slope and has no place in Montana, a state with sound wildlife management policies already in place. Let the House FWP Committee know that you will not stand for the commercialization of Montana’s wildlife. Please call members of the House Fish, Wildlife and Parks Committee, and ask them to VOTE NO on HB 279. Representative Joe Read (R-Ronan) has introduced HB 415, a bill which would prohibit the state from implementing any federal regulations limiting greenhouse gas pollution. 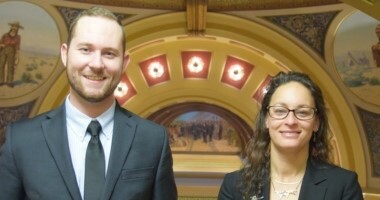 This bill also prohibits state employees from participating in any national discussion of greenhouse gas regulatory programs, meaning Montana’s opinion will not be considered when the federal government crafts a regulation on climate change. Please call your legislators and remind them that climate change is a global issue that requires action from all states in the nation. Take Action NOW – Confederated Salish Kootenai Tribes (CSKT) Compact is at a critical juncture. Lack of Federal action on the CSKT water compact is moving Montana toward great uncertainty. Montana’s tourism, agricultural and real estate economy is predicated on an unabiguous right to water. From irrigators to sportsmen and municipalities to commercial interests – ratification of the CSKT Compact in Congress is critical to Montana’s future. Please reach out to the Montana Congressional Delegation and express your support to ensure that the CSKT Water Compact, as passed by the Montana Legislature, is ratified in Congress. It is the only sensible solution that will benefit all Montanans. Please click on THIS LINK to make a toll free call or send an email to Senator Daines, Senator Tester, and Congressman Gianforte. Keep the message simple. Montanan’s haven’t forgotten the hard work it took to pass the compact, and congress shouldn’t hold up implementation. The 4th week of the legislature began and ended with petroleum issues which of course, is directly related to climate change, an issue affecting all of us. We worked all week to make it clear to our elected officials that continued dependence on oil and petroleum products have negative impacts on our birds, wildlife, and their habitat. You can help us spread this message: our citizen lobbying days are fast approaching and we hope that you will join us on February 6th and March 13th, locations TBD. If you are planning to attend, please RSVP by contacting Amy Seaman (aseaman@mtaudubon.org) or Wyatt Smith (wsmith@mtaudubon.org).